The wisdom literature can be found throughout all periods of ancient Egyptian history from the Old Kingdom through to the New Kingdom. 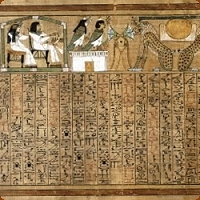 Much of the literature of ancient Egypt deals with the state religion, the relationship between the gods and the king. It is very rare to find literature that deals with relationships in a much more general way. There are examples of personal worship of the gods and personal feelings towards the gods, special prayers. The wisdom texts represent one special category of literature because they look at codes of behaviour and ethical values of the ancient Egyptian society, what they thought was right and wrong, and how they taught people and passed on moral codes. The wisdom texts were textbooks for teachers, for children to be brought up and taught a particular set of morals, ethics and values. They believed that these instructions had been handed down from the gods, the first examples go back to the Old Kingdom, but undoubtedly go back even further as an oral tradition, passed on from generation to generation. The texts are not about the afterlife, they concerned with living a good life and how to conduct your life on earth, and as such give us a different view of the ancient Egyptians. They are sets of rules for conducting personal relationships and standards of behaviour. These texts provide guidelines for manners, appropriate conduct in various social situations. The wisdom texts where used as schoolboy exercises thousands of years later. The values recorded in these texts are values that would stand up in any society today; they express kindness, moderation and the ability to make good judgements. These texts were for the upper classes of Egyptian society who would later in life take up official appointments and rule. The later texts of the New Kingdom and Late periods were more for middle class people, also during these periods different texts are composed and added. In the Old Kingdom, it would be the Prime Minister or King addressing his children, in the later periods it is an ordinary middle class man talking to his son. Most literature in ancient Egypt was anonymous, and the authors attributed to the texts were almost certainly not the composers of the texts, and their names were probably used to give it a greater credibility. This can be found on a number of papyri, modern translations are compilations of these different papyri. One version can be found in Paris, the Papyri Prisse, there are two copies in the British Museum, one dating from the Middle Kingdom and one from the New Kingdom, it can also be found on a wooden tablet that can be found in the Cairo Museum. Ptahhotep was the vizier of a Fifth Dynasty King, Isesi, his tomb can be found at Saqarra. Learn from the ignorant as well as the learned man. There is no artist who attains entire excellence. One can find it in the hand of a maid at the grindstone. In case you may be humbled. And that a man can say of them: “They are a heritage from my father”. Follow the dictates of your heart. This is just a small part of the wisdom texts of Ptahhotep. The texts deals with advancement in life advising caution in speech, refrain from becoming hotheaded, always be cool and calm, put your arguments logically, never loose your temper. Be prudent in friendship, there are other sections dealing with good manners in other people’s houses, others dealing with table manners, the correct behaviour to superiors, peers and inferiors. Young men are advised to marry young, and to treat their wives with solicitude. ‘The man who respects the poor is beloved of God. Be not covetous of wealth. Reject the latter, as though it had never come to your ears. Keep a sweet word ever on your tongue. Never allow a division to sunder what you say from what is in your heart. Now I can play a dirty trick on someone I dislike”. And that you cannot know what may happen tomorrow. And your silence will confound your enemies. Another papyri of wisdom text from the end of the Old Kingdom, preserved in two papri in the British Museum, both are written by the same scribe, a man called Duauf. It is sometimes known as the ‘Satire on Trades’ or ‘The Instructions of Duauf’. Duauf is not a scribe or vizier, but a common man, who has a son called Pepy. Who has been awarded a scholarship place and is receiving an education in the School of Books amongst the children of the magistrates. Duauf is anxious that is son take good advantage of this opportunity, that he should apply himself to his books and schoolwork, and become a scribe. It was a way of escaping from all the other trades available. Kheti was a king of the First Intermediate Period. When the momentous hour arrives. Put not your trust in longevity. Where these judges are concerned, a lifetime last but a single hour. And a man’s actions are heaped at his side. The person who makes light of it is an idiot. Like those who possess the keys of eternity. Act in such a way that your work will endure because it is endearing. It is the inside of the house that compels outward admiration. But choose a man because of his actions. Than the choice bull of the man who commits iniquity. There are obvious parallels between the biblical book of Proverbs, Ecclesiastes, Solomon, Psalms and the Book of Job.